With less than a week until the New Year, our thoughts naturally turn to change right now, don’t they? After all, the New Year represents a fresh start, a clean slate, and a renewed chance to pursue goals and dreams. 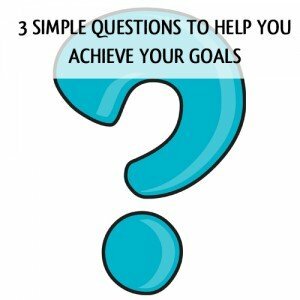 As you think about what you want in the New Year, here are three simple questions to help you set the right goals and make them happen. What are some great things that happened this past year? Thinking about the good we have in our lives creates a foundation of joy. That foundation can fuel and give us confidence to set new goals. Thinking about the good things in the past year also helps you tune into what makes you happy and feel satisfied with your life. This knowing can help you pick the best goals for the upcoming year, goals that when you work on them and ultimately achieve them will add to the richness of your life and cause you to feel truly satisfied. What do you want in the year ahead? Next, give yourself space to explore what changes you’d like to make in the next 12 months. Even if it’s a small goal, the act of setting goals helps you think through what you want out of a situation. Whether it’s a meeting, a project, or your life, when you enter into a situation with purpose and a predetermined idea of what constitutes a good outcome, your chance of being satisfied with the end result skyrockets. Goals give you purpose, perspective, and clarity about what you want. And once you have that, you’ll be inspired to take action and make it happen. What help will you need to get there? You don’t have to have your entire plan formulated to answer this question. Just off the top of your head, what sort of help might you need? Perhaps you need a friend or accountability partner to keep you on track. Maybe you need to find or create a plan to follow, or sign up for a class to learn what you need to know. Don’t fall into the trap of trying to go it alone. This can be isolating and also sabotage your success. Instead, make a plan now to get the help you need to achieve your goals in 2014. So…what are your big plans for the year ahead? I’d love to hear your answers in the comments below. Thanks for sharing! P.S. My online Goals class is now available on-demand! Start making progress on your dreams today, and make progress on your time schedule. Learn how this online goal setting class will help you create a life you love. Thanks for this head start on 2014’s goal workshop. Great things of 2013 included a scaling down in my involvement as a community activist, and, at the same time, an upsurge in creative activities. Also some home improvements. In 2014, I want more of the same (but with more emphasis on writing), along with growth in our farming project at our second home in Idaho. I’ll need help from DH and my friends, plus guidance from Simplify 101. Happy New Year to you, too, Frances! Happy to hear about your great things in 2013. Congrats! I look forward to seeing you in the Goals class! Great post, Aby! Thanks for clarifying some questions here – I do think these will help me improve my goals and plans moving forward. Thanks Ola! Glad I could help. Thank you so much for your comment! What terrific goals you have set for yourself. By the way, all of my online classes (except the free one) include access to a community forum so you would have someone to be accountable to. Accountability is a great motivator when it comes to achieving goals.